It’s 2018, and when you get home from work, you wave your “smart” phone in front of a “smart” lock to let you into a room that has been perfectly climatized by your “smart” thermostat, which knows you get home at 7:15 p.m. and turns the A/C on just beforehand. You step over a robot vacuum that is finishing its last pass of a pre-scheduled cleaning and plop onto the couch. You ask your “smart” speaker to water the plants, start the washing machine, and turn on the TV. Then, from your phone, you order dinner. This would make you part of the one in six Americans (1) or one in twelve Canadians (2) who own smart speakers, and in each of those 50 million households, Alexa, Google, or Siri patiently waits for instructions, recording your voice and searching for requests and commands. But why, after so many drawings, model homes, and working prototypes, are today’s actual smart homes just speakers that sometimes turn on lights? What happened to the 3D printers for disposable dinner plates, as Paul McCobb proposed in his 1967 model home? Or Doc Brown’s dog-feeding robot in Back to the Future? Or even rounded corners to improve cleaning, following the lead of Buckminster Fuller and Peter and Alison Smithson? If you lived in the universe of Blade Runner: 2049, your virtual girlfriend “Joi” would chat with you about your day while she moves about the kitchen and warms your dinner.If your home was in Ray Bradbury’s There Will Come Soft Rains, the house would unfold a card table and set up your weekly game of bridge. It would set out dinner and clean it up an hour later, even if no one was home. And if you were Pee-Wee Herman, you would go to sleep in a bed that automatically draws the sheets up, knowing that in the morning, a breakfast machine would prepare bacon and pancakes for you. Be it the simple machines of the breakfast machine or the advanced artificial intelligence of “Joi,” these are automated homes, imbued with agency in the interaction between human and environment. The automated home—real and imagined—draws from a longstanding motif in popular imagination. Alongside a growing catalogue of fictional automated homes, the development of computers and electronic protocols has made it possible to bring many domotics—a portmanteau of domestic robotics—into reality. This has produced a rich interchange between fiction and reality that continues today. But what compels us to bring our houses to life? And how is that changing the way we occupy our homes? Le Corbusier’s 1923 declaration that “a house is a machine for living in,” was an early effort to clarify the role of the house in an industrialized society. He claimed that unlike airplanes, the forms of which are guided by the statement of the problem and its regulation, “the problem of the house has not yet been stated.” (3) In the century since Le Corbusier wrote Towards a New Architecture (Vers Une Architecture), automation has only become more integral to other facets of society, and its place in the home continues to present a unique interface between human and machine. Domestic life has some need for efficient, robotic taskmasters—for cleaning and cooking, for instance—but unlike factories, the efficiency of an automated process is not the only purpose of the home. Le Corbusier’s provocative statement ignored the leisure activities and world building that play out at home, as we construct an environment that reflects our identities and dreams. Home is not merely functional, but aspirational. What does that mean for domotics, justified as time savers in a domestic space that is often focused on making and re-making a reflection of a life imagined? A survey of historical automated homes covers a breadth of technology and complexity. The lion’s share of domotics are task-oriented, ostensibly making time for leisure activities. By asking domotics to take on the mundane, we begin to fashion a lifestyle and aesthetic made possible by our homes. The vision of a life we want to live relies on a cohabitation with domotics that are increasingly imbued with low-level artificial intelligence, allowing our homes to in fact become companions. Sometimes components of automated houses become comically complex, as illustrated in Rube Goldberg’s cartoon series, The Inventions of Professor Lucifer Gorgonzola Butts, first run in Collier’s Magazine in 1928. In each strip, Professor Butts would solve a relatively simple problem through an extravagant mechanical process. The concept took off, and has been applied to innumerable situations in the decades since. 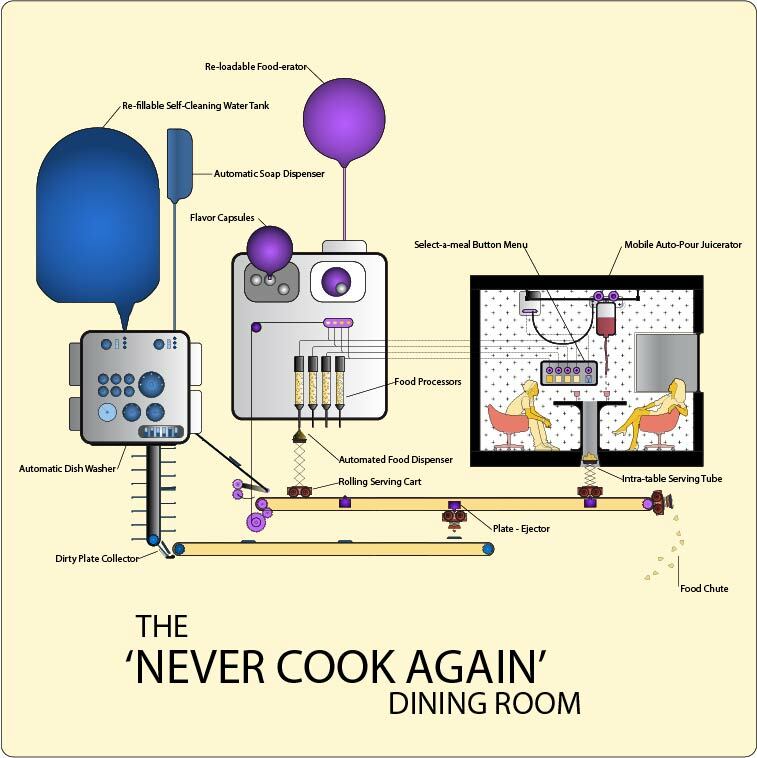 “Rube Goldberg devices” still appear on TV and in movies, often as elaborate breakfast-preparing machines. Pee-Wee Herman has a breakfast machine in Pee-Wee’s Big Adventure, as do Caractacus Potts in Chitty Chitty Bang Bang, the Szalinski family in Honey I Shrunk the Kids, and Doc Brown in Back to the Future I and III. With a tug of a string or a push of a button, the house will make breakfast, leaving you free to sing, work, or play as you please. Instead of avoiding cooking, Frances Gabe invented and built, among other things, a machine that cleaned her house for her. After years of building her prototype, she patented the self-cleaning home in 1984. (4) Its built-in sprinkler system sprayed water across perforated shelves and surfaces, ultimately falling to a drain in the gently sloped floor. While the cleaning took place, Gabe would passively watch the work happen, either from the opposite side of a closed glass door, or in the room itself, underneath an umbrella. The house, which has been described as ‘basically a gigantic dishwasher” (5) never took off commercially, and the prototype at Gabe’s own residence is the only one that was ever built. Though Rube Goldberg devices are still more closely associated with wacky inventor geniuses and Gabe’s house was never a commercial success, they join a long lineage of domotics that relieved the housewife of her duties. In the 1940s and 1950s, automated processes moved beyond mechanical systems into computational and electronic processes. Through advertising in magazines like Ladies Home Journal, companies marketed futuristic kitchens to households by promising that less housework could in fact produce cleaner houses. In 1956, General Motors sponsored a short musical called Design for Dreaming to illustrate how great this could be for a housewife. In the ten-minute film, a woman dances among showroom cars and into a model kitchen, where she sings about how little work goes into baking a cake in her kitchen of the future. The cake requires so little of her time that she is able to play tennis and go swimming while the kitchen does the work for her, producing a pristine decorated cake from a clear bubble form at the end of the counter. The Jetsons, which premiered in 1962, fortified the link between the housewife and her automated home. The pilot opens with the family’s morning routine. Despite owning a push-button insta-meal machine, the mother, Jane, is still responsible for pushing the buttons and thus, in concert with the machine, feeding her family. While her family waits at the kitchen table, she prepares dinner…with a poke of a button. The Jetsons’ automated home devices were hidden behind walls and would flip out from nowhere to serve the family, folding back into the wall when no longer needed. This was in some part an efficiency in cartooning, but also picked up on an evolving aesthetic sensibility that we still associate with the future. For the modern family in search of a clean, uncluttered home, the house responds with smooth flat surfaces and hidden appliances, available on request. Like the housewife cooking dinner with the push of a button, her companion kitchen also seems to do no work. The modern kitchen hides its appliances and functions behind sleek panels, presenting only the void of an empty countertop. This has only become more amplified as domotics are increasingly electronic and ephemeral, in both real and imagined life. Automated houses are not just maids, though. They alter the very nature of home and space. Alison and Peter Smithson’s 1956 House of the Future provided an early demonstration of the shift away from housework and toward lifestyle. It had its requisite time-saving functions: a self-cleaning bathroom and window (who dreams up a future of cleaning toilets and washing windows?). The walls of the house—prefabricated plastic shells—had rounded corners, which the Smithson’s claimed would improve cleaning (Buckminster Fuller made the same argument about corners in his Dymaxion house). The air-conditioning system, in addition to providing the optimal climate at all hours of the day, doubled as an air purification system. The House of the Future was occupied by four models who moved about and interacted with the house. They reclined in futuristic plastic chairs, prepared for dinner at automated vanities, and toggled the controls of different parts of the automated house. Computerized panels on the walls controlled light and temperature, operated the front door, and operated the dining room table to suit the occasion. The house used plastic everywhere, including the plastic prefab walls and structure, nylon sheets in the bedroom, and little plastic sacks of pre-broken, pre-separated eggs in the kitchen. The bed sunk into the floor when not in use, as did the dining room table, which, depending on the occasion, could drop to a coffee table height, or all the way into the floor for a party. The transformative design of the house allowed its occupants to control their environment. The house was designed to be tinkered and played with. The Office for Metropolitan Architecture’s 2013 Knoll line “Tools for Life” picks up on this impulse. The furniture swivels and wobbles. The coffee table can be raised and lowered with a large red button, a pleasant admission that the point of raising the coffee table is not the practicality of having a taller table; it’s the delight of altering the object. In Rem Koolhaas’ words, the furniture “performs in very precise but also in completely unpredictable ways, furniture that not only contributes to the interior but also to the animation. "(6) Chairs swivel because it’s more fun to sit down when chairs respond to you and animate the environment. Koolhaas’ “Tools for Life” acknowledge a shift away from the practicality of automated homes and towards the lifestyle and delight that they foster. Perhaps it is because we now know the promised convenience was false. In 1967 Walter Cronkite toured a Paul McCobb-designed house of the future on his weekly CBS show “The 21st Century.” The house was replete with automated processes in each room, including a home office with multiple monitors for printing online newspapers, checking stocks, and watching a closed-circuit feed of other areas of the house. In the future, Cronkite forecasted as he toured McCobb’s house, technology will both liberate us from the 40-hour work week and entertain us in our newfound free time. This has not happened; the 40-hour work week has expanded into the 60-hour work week, in part because we can indeed bring our work home with us. The lifestyle conjured by the Smithson’s and McCobb cast the house as a sort of companion to its occupants. The operations of the house were complex and a touch magical, but the presentation, the interface, was soothing and welcoming. Minimalist decor and clean surfaces are less intimidating than exposed mechanics. The resulting aesthetic, with nods to 2001: A Space Odyssey, brings the automated house to life, welcoming it into daily activities and actions. With the push of a button or a voice-command, the house lurches into motion and carries on with the dialogue of gestures and actions between inhabitant and habitat. In an era steeped in Cold War paranoia and nuclear fallout bunkers, the House of the Future was a self-contained entertainment and survival system, sealed off both physically and socially from its surroundings. The house itself became a companion to the occupants. The 1975 invention of the X10 protocol made it possible for a machine to pair a large number of commands with a large number of responses. This enabled us to actually build many of the previously fictional devices. The X10, which remains the industry standard today, allowed machines to move beyond an “on-off” dichotomy. It made the automated home a functioning reality, allowing us to test our hypotheses and find out if it is really possible to eliminate housework. Today, in addition to the X10 protocol, low-level artificial intelligence and internet connectivity are driving the development of domotics. But we still work, cook, and clean our homes. Perhaps the justification for our living homes was misdirected. Barring a few key examples, automation hasn’t saved us from housework, it has merely altered the face of housework. The handful of appliances that have truly transformed domestic life—like the microwave, the fridge, the washing machine—are inserted into otherwise analogue houses. And yet, through the internet of things and smartphone apps, we are still trying to improve them. The promise, however, has shifted. Our automated homes are increasingly integrated with low-level artificial intelligence and promoted as “smart homes,” as if the automated home needed only a brain to fulfill its potential. In a justification for a house that senses its own needs, the smart home is less often presented as a time-saver; instead it is more focused on specialization and machine intelligence: a sprinkler system that can read the weather, an app-controlled washing machine that has dozens of different wash cycle settings, a smart speaker that can respond cheekily if you ask it to divide by zero. It is as though the living house is ultimately just an occupiable robot companion, increasingly able to sense and respond to the humans inside. Large red button withstanding, we are happy to tinker with our smart homes, playing with the interactive elements we’ve installed for our own pleasure. In this shift away from functional concerns, the smart house comes to life. We establish a living home whose operations and behaviour take on anthropomorphic and sentient qualities. 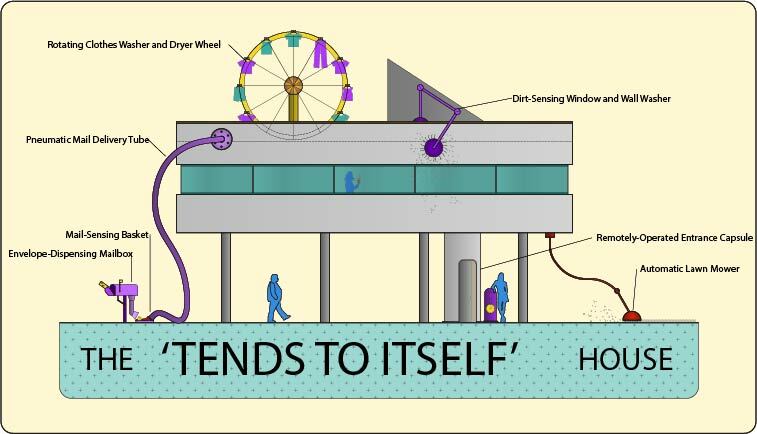 Just as Rube Goldberg machines are ultimately mechanical processes for the sheer delight of watching mechanical processes, so too are today’s living houses. Silly as it may look, we are happy when our house draws the blinds while we are still asleep, the dishwasher orders more soap for itself, and the TV can accept and reject phone calls, even if it doesn’t quite work reliably. The automation follows less in the footsteps of Frederick Winslow Taylor’s Efficiency Movement, and more along the lines of Jean Tinguely’s machine spectacles. Until his death in 1991, Tinguely brought machines to life by assembling found materials into mechanical structures. When he set them into motion, the machines would behave erratically and unpredictably, delighting Tinguely regardless of the outcome. The creation, destruction, and recreation of Tinguely’s machines is part of what makes them so compelling. They echo the impulse to edit our environment through alternating acts of creation and destruction. Like Tinguely’s machines that undergo a singular kinetic performance of self-destruction, Rube Goldberg devices need to be re-set up after each complete sequence of operations. String must be re-tied, balls put at the top of coils, and dominoes un-toppled. This process inherently introduces continual tinkering and improvements. Each execution, thus, is a precise but unique performance. This doesn’t discourage people from actually building them either. Dozens of videos of real life Rube Goldberg machines exist online, many of them hilariously more destructive than not as they topple bookshelves, scatter marbles, and knock over jugs of water in order to butter a piece of toast. It is often the desire to leave a mark on our environment that compels us to integrate our homes with machines. The delight of watching a process we have set into motion is rewarding in and of itself. With each attempt to understand why we automate our houses and make them more complicated than they need to be, we must remember that the act of creation itself is often the justification. We design and remodel our homes with the tools at hand, which, in the twenty-first century, include artificial intelligence and domotics. If anything, our automated homes have created a richer and more complex terrain of interaction with our environment. A living home can behave unexpectedly and generate a new sequence of effects. As Beatriz Colomina observes of the Smithsons’ House of the Future, “there are no children in the house, because the adults themselves have become children, playing with their toys, with their new electronic gadgets, the peek-a-boo table and bed, the electrically operated doors, and so on.” (8) The automation of our houses is as much about our desire to control our environment as it is about what the devices actually do. It is through the automated house that we navigate the balance between function and aspiration. (1) Brett Kinsella and Ava Mutchler, Voicebot Smart Speaker Consumer Adoption Report, Voicebot, Pullstring, and RAIN Agency, January 2018, 3, https://voicebot.ai/voice-shopping-report-2018/. (2) Edison Research and Triton Digital The Infinite Dial: Canada 2018, , April 4, 2018, 12, https://www.tritondigital.com/media/default/documents/Infinite_Dial_Canada_2018.pdf. (3) Le Corbusier, Towards a New Architecture, trans. Frederick Etchells (New York, NY: Dover Publications, 1986), 4. (4) Frances G. Bateson, Self-cleaning building construction, U.S. Patent 4,428,085, filed April 21, 1980, issued January 31, 1984. (5) Margalit Fox, “Frances Gabe, Creator of the Only Self-Cleaning Home, Dies at 101,” New York Times, July 18, 2018. (6) Emilie Chalcraft, “Tools for Life by OMA for Knoll,” Dezeen, April 13, 2013, https://www.dezeen.com/2013/04/08/tools-for-life-furniture-by-oma-for-knoll-at-prada-milan/. (7) The 21st Century, episode 1, “At Home, 2001,” hosted by Walter Cronkite, aired March 12, 1967, on CBS. (8) Beatriz Colomina, “Unbreathed Air 1956,” Grey Room, no. 15 (Spring, 2004): 28-59, http://www.jstor.org/stable/20442644. Lane Rick is a registered architect in New York and a principal at Office of Things, a collaborative studio engaging in the architecture and design of things—both material and intangible. Lane also writes and draws about idiosyncrasies that emerge from high and low culture in the constructed environment. Her writing has been published in Architect’s Newspaper, The Site Magazine, and uncube magazine, and her drawings have been shown in galleries in Shanghai, Toronto, New York, and Atlanta.